When I heard that Ray Bradbury had passed about eight days ago, I realized that I had never read any of his books. Wow, that surprised me. Well, in honor of his passing, I decided to read his most popular and enduring work, Fahrenheit 451. Both of those passages were spoken by Mr. Faber, a former professor, to Guy Montag, the main character of the novel. Guy is a fireman living in a grim, dystopian society where books are outlawed and anyone caught having books gets them burned to temperature of Fahrenheit 451. However, he discovers upon burning books that something is not right and begins to realize he may have been doing the wrong thing all along. Guy meets a few characters that confirms his suspicions and the transformation begins. This is such a well-known novel and covered from so many angles that I have just a few observations after reading it. 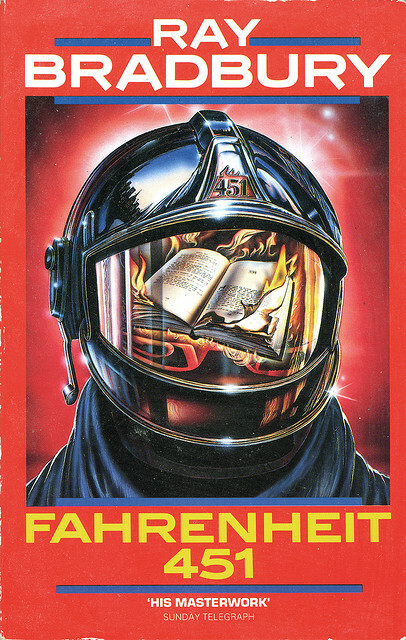 Fahrenheit 451 is Ray Bradbury’s love letter to books and literature. His prose is full of poetic imagery and all sorts of literary allusions to great authors from the past. I could sense that writing this novel probably sadden him on some level and if the prophecy of this story ever came true….it could have probably broken his heart. I must admit that the novel felt cold and distant even though it was readable and engaging. I didn’t get any warmth or connection from Guy and the other characters. It was like watching a documentary on some alien society that was destroying its own soul. Nevertheless, the story came across as believable and frightening in its implications. Even though, we live in a multimedia/electronic age, the written word needs to be appreciated and cherished for as long as possible. Fahrenheit 451 is an American classic and should be read at least once by all lovers of fiction. Very good review of an excellent book Marion! You describe it like a society killing its own soul, and you hit it on the head. I just realized when I read that. It’s exactly what they’re doing. They’re killing the soul of society when they burn the books. Thanks Kaleb! That’s what it felt like when I read it. Bradbury is in my top five favorite authors and this book is one of the few that I have read multiple times. A true classic. Thanks for your comments, Ancient Explorer. Fahrenheit 451 was a good read. Wisdom From Kammbia 2.17: What Is Your Reading Bucket List?